Modern systems are more direct. The satellite broadcasts a signal that contains orbital data (from which the position of the satellite can be calculated) and the precise time the signal was transmitted. Orbital data include a rough almanac for all satellites to aid in finding them, and a precise ephemeris for this satellite. The orbital ephemeris is transmitted in a data message that is superimposed on a code that serves as a timing reference. The satellite uses an atomic clock to maintain synchronization of all the satellites in the constellation. The receiver compares the time of broadcast encoded in the transmission of three (at sea level) or four different satellites, thereby measuring the time-of-flight to each satellite. 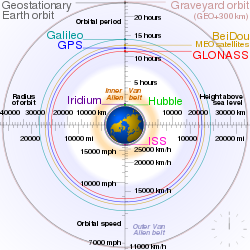 Several such measurements can be made at the same time to different satellites, allowing a continual fix to be generated in real time using an adapted version of trilateration: see GNSS positioning calculation for details. This page was last edited on 26 April 2019, at 04:30 (UTC).